Hayward Malcolm Hutchinson was a consummate businessman with a winsome and diplomatic persona. 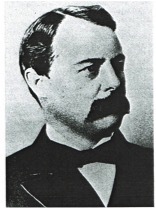 Hutchinson’s greatest role was as the primary founder of the Alaska Commercial Company. What we know of him has been gleaned through US government documents, newspapers of the times, Alaska Commercial Company records, and property deeds filed in the District of Columbia and Maryland. He was born at Milford, New Hampshire on January 19, 1832 to a large established clan of Hutchinsons who emigrated to the United States from England. His father was David Hutchinson and mother Elizabeth Hayward of the Baltimore Haywards. He had three brothers Jesse, Elias and John. [i] The brothers would own several successful businesses together. In August of 1867 he journeyed with General Rousseau, by ship from New York to San Francisco. One of his fellow passengers was a man named Abraham Hirsch whom Hutchinson spoke with at length and eventually came to an agreement with regarding going into business together. [vii] Certainly, by the time he reached San Francisco, he already had a strategy in mind. Sloss joined the gold rush of 1849 where he ended up selling livestock and mercantile goods to other miners. [ix] In 1850 he partnered with Simon Greenewald and Lewis Gerstle (Jewish merchants of similar mind) to operate a wholesale grocery business in Sacramento. [x] In this they were very successful; so successful that upon moving to San Francisco they ploughed their disposable income as venture capital into other merchants’ enterprises. Lewis Gerstle landed in the gold rush tent city of San Francisco with just enough pennies to startup a fruit stand in 1850. [xi] Business and family combined when the men married the sisters Hannah and Sarah Greenebaum. [xii] By the late 1860s the two men were well-known for financing entrepreneurs. Their company diversified to selling mining stocks, dealing in hides, and shipping interests as well as capitalizing other entrepreneurial enterprises. And fur trading. It was this last venture that featured largely in Hutchinson’s plans. He had learned from General Rousseau that the Hudson Bay Company, the largest maritime fur trading firm in the North Pacific, had lost their fur concession from the Russians in 1865. All the rich peltry of the coast from 48 degrees latitude at Victoria, B.C. to the Yukon River at 62 degrees had been under their purview. Hutchinson was a shrewd entrepreneur who knew the value of locating as much local knowledge as possible and having his ducks in a row, particularly of the magnitude he had in mind. He launched into a fact-finding mission. After confirming with Sloss and Gerstle on financing and (presumably) letters of credit for himself and his now-partner Abraham Hirsch, he set out to learn more about the Russian Colonies and the fur trading businesses. While the delegation sped to the Russian American capital at Sitka for the formal transfer aboard the Navy vessel OSSIPPEE, Hutchinson traveled to Portland with Louis Sloss. [xiii] By late November, Hutchinson had completed his fact gathering and headed north to Sitka. Hastening to speak with the head of the Russian American Company, Hutchinson made an appointment to talk with the ceded colony’s last governor. In mid-January of 1868 he met two other merchants: shipping magnate, William Kohl, and premier Northwest fur trader, Leopold Boscowitz. [xvi] It was during this voyage these men realized that by combining their efforts, they could all profit handsomely. [xvii] All the elements of a vertically integrated business enterprise were coalescing as the Hutchinson & Kohl Company, by the time they reached San Francisco in early February. Two other men with significant skills joined the company: Captain Gustav Niebaum, who had worked for the Prince for many years taking vessels to the various Russian colony ports. Finally, August Wasserman a fur wholesaler with European markets and another fur trading colleague of Kohl’s, joined the group. [xviii] At some point during the evolution of the business, Abraham Hirsch dropped out of the partnership with Hutchinson. All the considerable knowledge and experience of these businessmen were now in play that spring of 1868. In May of 1868 Niebaum, the youngest of the business partners at 25 years of age, sailed Hutchinson and Maksutov from San Francisco back to Alaskan waters so the prince could personally ensure the formerly Russian trading post operations were effectively handed off to Hutchinson. They stopped at Kodiak, Unalaska, St. Michael, and finally St. Paul, in the Pribilof Islands, the site of the main sealing operation. [xix] Once they arrived, they found both St George and St Paul Islands overrun by other sealers who were busy slaughtering seals indiscriminately and plying many of the local working Aleuts with whiskey. Hutchinson was aghast that his new operation had been thrown into chaos as thousands of seals were being taken, decimating the herd of fur seals. Hutchinson employed his persuasive skills with several of the rogue sealers. At the end of that disastrous season which saw over 200,000 seals taken Hutchinson left the Pribilofs certain that if one exclusive monopoly to operate the sealing effort on the seal islands was not granted, the competition amongst the sealers would wipe out not only the seal herd but also the Natives generating no livelihood for the them nor profits for anyone. When he returned to San Francisco that fall Sloss and Gerstle agreed with him. So impressed was Maksutov by Hutchinson’s good nature and business acumen, he offered the businessman even more: a sealing operation in the Russian Far East Kommandorski Islands. [xxi] This decision immediately broadened the scope of Hutchinson’s fur trading strategy to include the exclusive sealing operations thus ensuring the control of the seal pelt business worldwide. Congress had also been busy that summer. On July 27, 1868 the Fortieth Congress passed two important measures related to Alaska: the first an appropriation to actually pay the treaty price of $7.2 millions to the Russian Czar and the second an act extending the laws of the United States relating to Customs, Commerce, and Navigation over the ceded territory. [xxii] The District of Alaska was formally established to collect customs duties. But, having heard of the indiscriminate slaughter of one of their newest sources of potential customs revenue, Congress prohibited the killing of ‘otter, mink, marten, sable or fur seal’ at sea or on land in Section 6 of the second act. For the newly minted Alaska Commercial Company to be successful, they would have to secure the permission for an exclusive trade monopoly on the fur seal fishery. Thus, begins the second part of Hutchinson’s career with ACC as a lobbyist in Washington, D.C.
Hutchinson reunited in December of 1868 with his extended family and his wife, Eliza, whom he hadn’t seen in a little over year having left for Alaska in August of 1867. [xxiii] Louie Sloss brought his wife and their four daughters with him planning to spend the winter in Washington. [xxiv] Using his network of political contacts, established when he was a presidential elector in California supporting Ulysses S. Grant’s successful bid for the office, Sloss intended to convince Congress to reopen the fur seal islands as an exclusive fishery, and most importantly, to ensure that it was the ACC who received the trade monopoly. [xxv] It took nearly two years but in June of 1870 such a measure finally passed into law. Hutchinson, no Odysseus, chose to remain in the District of Columbia with his family. [xxviii] He delegated the everyday operations of Hutchinson, Kohl & Company (now also headquartered at ACC’s building at 310 Sansome Street) to the capable Capt. Kohl. Hutchinson while he continued to attend to the company’s interests in Congress. During these years, he continued to act as the eastern manager of the Alaska Commercial Company (holding the office of secretary for a period of time on the Board of Directors), as well as direct his fur trade and shipping interests in Hutchinson, Kohl Company. At the apex of his successful business life, a happy family life, and even greater opportunities to come, Hutchinson was stricken with an unknown but debilitating illness in the late winter of 1882. [xli] He passed away on May 10, 1883 at Sitka Farm, with Eliza and his daughters around him. He was 51-years old. He was laid to rest at Rock Creek Cemetery where the family mausoleum remains to this day. J Pennelope Goforth is an author, maritime historian, and owner of SeaCat Explorations. [i] U.S. Census 1860 data for Maryland listed all the family members. [ii] Progressive Age, page 4. The article outlines the industrial reputation of Hayward as well as his family connections. [iv] For many years writings about Hutchinson referred to his ‘selling cooking utensils’ which as further research has shown, was only a minor part of the business he conducted with his brother during the Civil War. [v] National Republican, APRIL 13, 1883. [vi] Papers Relating to Foreign Affairs, page 405. [viii] Well-founded supposition which tallies with what is known to have occurred: Hutchinson had the strategy and wherewithal to implement it. Ultimately they became his partners in the ACC venture. [xiii] Sloss, Pierce. The Hutchinson, Kohl Story, page 3. [xiv] Sloss, page 74. These included all the commercial properties of the RAC which Maksoutov was to sell on behalf of the shareholders. [xv] House Report 623, page 188. [xvi] Sloss, Pierce. The Hutchinson, Kohl Story, page 4. [xvii] Again, a solid assumption based on later events. [xviii] Sloss, Pierce. The Hutchinson, Kohl Story, page 6. [xix] Sloss, Who Owned ACC, page 122. [xxiii] House Report 623, page 111. [xxv] Sloss, Who Owned ACC, page 123. [xxvii] Lease of Alaska Commercial Company, page 1. [xxviii] The line of enquiry into Hutchinson’s family business continues at the time of this writing. [xxix] Daily Alta California, November 6, 1871. [xxxii] House Report 623, page 118. [xxxiii] National Republican, April 8, 1880. [xxxiv] National Republican, November 9, 1881. [xxxv] Note: this is a line of enquiry still being pursued with the Hillandale Citizens Association of Montgomery County, Maryland. HCA Historical Notes, page 1. [xxxvi] National Republican, April 13, 1883. [xxxvii] National Republican, November 9, 1881. [xxxviii] Index of Patents, page 210. [xxxix] Evening Star, September 7, 1882. [xl] The Evening Star, March 22, 1880. [xli] National Republican, May 11, 1883.